Frederick Adcock was born in Chilwell, Notts, probably in December 18982, the sixth child, youngest son of Walter (b. c1866, Chilwell) and Jane Adcock (b. c1867, Harby, Leicestershire née Norris). In 1901 the family, then including five children and Jane's widowed mother, was living on Main Road, Chilwell with Walter working as a labourer at Beeston Foundry3. By about 1905, the family had moved from Chilwell to neighbouring Beeston. By 1911, the family, now including two further daughters, was living at 41 Stoney Street4. By 1915, Frederick had joined his father at Beeston Foundry, working in the moulding shop and the family had moved to live at 84 Lower Regent Street, Beeston5. Although aged 16, he was still too young to think of enlistment, the picture changed considerably in January 1916. By then, the number of men volunteering for service was diminishing and was not meeting the relentless demand from the Western Front. The Derby Scheme, which introduced canvassing for volunteers had still not persuaded the required numbers and the Military Service Act was now enacted which meant that all single men aged between 18 and 41 (with some exceptions) would be automatically conscripted. In May, this was extended to married men and in 1918 the age limit was extended to 51. Now, Frederick had no choice. He was automatically deemed to have enlisted on 1 March 1916 and liable to be called for service as soon as he was 18 - that is in December 1916. In the meantime, the natural concern within his family was deepened when Frederick's brother Russell was killed on active service on 7 September 19166. It seems significant that, within days of hearing the tragic news, Frederick left his job at the foundry and, so it appears, started a job working with horses. With his own call-up just months away, it seems that he and his family considered that his best option was to join an Artillery unit rather than the high-risk infantry. So it was that when he was called for service on 14 April 1917 at Ilkeston, aged 18 years and 5 months, he declared his 'trade or calling' as 'Horseman' and his preferred branch of the service as 'Royal Field Artillery'. It made no difference. The urgent need for infantry meant that he was, nevertheless, attached to the Durham Light Infantry and he joined its training battalion at Rugeley Camp in Staffordshire for basic training7. On 20 January 1918, less than a month after his 19th birthday, Private Adcock arrived in France and was initially assigned to 10th Battalion but, after the 10th was disbanded as part of rationisation, part of an attempt to address the acute shortage of replacements for the front-line losses, he was almost immediately attached to 2nd Battalion, part of 18th Brigade of the 6th Division. This old established battalion had originally landed in France in September 1914 and had fought in many of the major battles since - such that almost none of original contingent were still serving. But, as Private Adcock settled in to his first experience in front-line trenches, in February 1918, things were quiet and uneventful. It was to be the calm before the storm. During March, the battalion was near Bapaume taking turns in the Morchies sector of the front-line trenches. The absence of significant enemy activity was unusual and suspicious, such that, on the 4th, a raiding party was sent out, looking for prisoners that could be taken to interrogate. None were found, and the expected enemy positions were deserted - confirming suspicions that something was about to happen. Then, on 21st March, the German Army launched its Spring Offensive from the Hindenburg Line with the objective of ending the war before American troops and resources could tilt the balance towards the Allies. The objective was to smash through the Allied lines, push the British forces into the sea and to cut off their supply lines by seizing the ports. 2nd Battalion, which was in the front line at the time, came under very heavy shelling - including a large amount of gas shelling necessitating the use of respirators. Nevertheless, the men fought resolutely in the face of the subsequent very strong attack. But eventually, with heavy machine-gun fire on three sides, heavy losses and the enemy continuing to advance strongly, the decision to retire was taken when the position became impossible to hold - and mist cover made it practical8. The losses on that day were horrendous, with the battalions original strength of 30 officers and 630 other ranks being reduced to just 2 officers and 58 men. Many of the casualties were killed or missing - amongst those missing, having been in France for less than two months, was Private Adcock. His body was never found and his death was not confirmed until over a year later, on 27 May 19199. Having no known grave, Private Adcock is remembered on the Arras Memorial in the Faubourg-d’Amiens Cemetery which is in the Boulevard du General de Gaulle in the western part of the town of Arras. The cemetery is near the Citadel, approximately 2 kilometres west of the railway station. The Faubourg-d’Amiens Cemetery was begun in March 1916. It continued to be in use by field ambulances and fighting units until November 1918. After the Armistice the cemetery was enlarged when graves were brought in from the surrounding battlefields and from two smaller cemeteries in the vicinity. The cemetery contains 2,651 burials from the First World War. The Arras Memorial commemorates almost 35,000 soldiers from the United Kingdom, South Africa and New Zealand who died in the Arras sector between the spring of 1916 and 7th August 1918 and have no known grave. 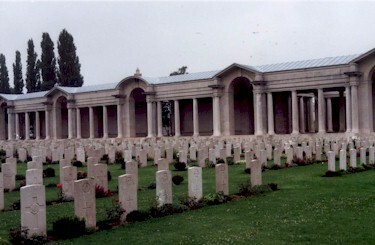 The most conspicuous events of this period were the Arras offensive of April-May 1917, and the German attack in the spring of 1918.The cemetery also contains the Flying Services Memorial which commemorates nearly 1,000 airmen of the Royal Naval Air Service, the Royal Flying Corps, and the Royal Air Force, either by attachment from other arms of the forces of the Commonwealth or by original enlistment, who were killed on the whole Western Front and who have no known grave10. After the war, his parents were left to live out their lives in Beeston having lost two of their three sons but with the support of their surviving son and their five daughters. Jane died in 1926, aged 58. Walter followed in 1935, aged 68.13. 3Chilwell, Notts, 1901 Census, Piece 3208 Folio 30. 4Beeston, 1911 Census, Piece 20426 RD429 SD3 ED1 Schedule 180. 5Beeston Foundry (later Beeston Boiler Company) records. 6Russell's details may be seen here. 7Details of his enlistment, including his declared employment, service preference and subsequent deployment are from his Army Service Record (available at ancestry.com). 8This account of the battalion's involvement in the action is based on its War Diary (available at ancestry.com). 9The delay in declaring his death is recorded in his Army Service Record. Presumably the possibility that he had been taken prisoner had to be considered. 11Details from Frederick's Medal Card and Medal Roll - available on ancestry.com. 12Details from "Army Register of Soldiers' Effects, 1901-1929" - available on ancestry.com. 13Both deaths were registered in Basford Registration District (of which Beeston was part). Jane's in Q2/1926 (ref 7b 199) and Walter's in Q2/1935 (Ref 7b 220).